Public attitudes are more open and accepting of LGBT Americans today, and marketers are increasingly showing their support of their LGBT customers. Experian Simmons includes a measure of sexual orientation among non-Hispanic respondents of our National Consumer Study, the only known large probability sample syndicated study to include such a measure. In our 2012 LGBT Demographic Report, we looked at marriage and cohabitation habits, as well as income levels and discretionary spend of LGBT and heterosexual adults alike. This data helps marketers better understand and connect to the growing and already influential LGBT demographic and to benchmark important factors against the heterosexual population. 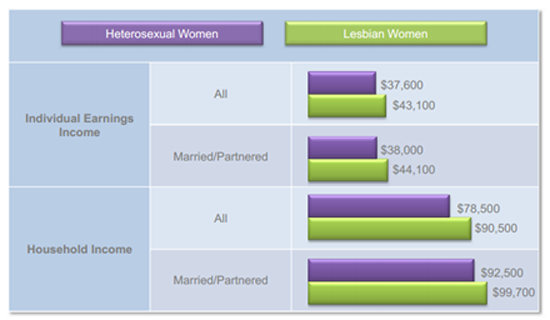 A look into individual earnings and household incomes shows that lesbian women earn more than heterosexual women regardless of relationship status. Specifically, the typical adult lesbian woman personally earns $43,100 per year compared with $37,600 claimed by the average heterosexual woman. Furthermore, the typical household income of a married or partnered lesbian woman is $7,200 higher than that of a married or partnered heterosexual woman. When it comes to individual income, gay and straight men may earn roughly the same amount, but married or partnered gay men personally take home nearly $8,000 more, on average, than their straight counterparts. Additionally, the average household income of a married or partnered gay man is $116,000 versus $94,500 for a straight married or partnered man. Income levels are important to consider when targeting consumers, but more important is determining the amount of money they have left over after the bills are paid for non-essentials. Despite having higher incomes, some may be surprised to learn that lesbian women have only the same amount as heterosexual women to spend on discretionary items. 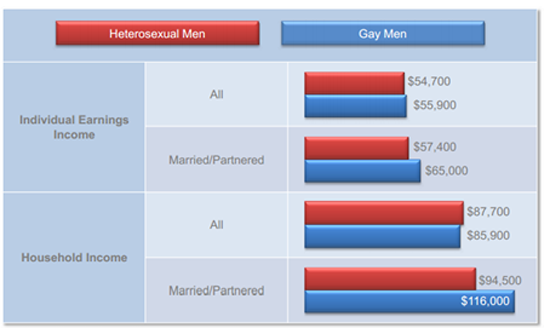 Likewise, gay men have less than heterosexual men for non-essentials overall, even though their incomes overall are quite equal. This is mostly likely due to the fact that both lesbian and gay adults tend to reside in larger cities where the cost of living can be considerably higher. Interestingly though, when household size is brought into the equation, we see that gay males actually have more to spend on non-essentials per capita than straight men. Gay men, for instance, live in households that spend $6,256 per capita annually on discretionary spending, nearly $1,000 more than what the households of heterosexual men spend per person. For more demographic and attitudinal information on the trends among the LGBT population, download the 2012 Lesbian, Gay, Bisexual, Transgendered Demographic Report.